Champagne corks will be popping when you grab a superb deal on wines and beverages like beers and spirits. So roll out the barrel and celebrate getting yourself a top cashback and voucher code reward. Get the best beers delivered to your door with Beer52's craft beer club. 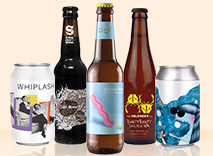 Receive eight fruity, hoppy or strong beers each month and earn top cashback. Buy beer, wine and spirits at TheDrinkShop. Browse prosecco and Champagne, vodka and gin, tequila and sambuca, as well as gifts, and earn cashback. Buy red, white and rose wine from Italy, Australia, France and New Zealand from The Sunday Times Wine Club. Shop spirits or hampers and earn cashback. Visit 31DOVER.com to buy beer, spirits and Champagne. Shop for red, white and rose wine, as well as vodka, whiskey, tequila and gin, and get cashback. Enjoy food and beers at Vintage Inns pub restaurants. These country pubs offer gardens, scenery and log fires to enjoy lunch. Buy and earn cashback. Browse mini bottles of alcohol at Just Miniatures. Personalise wine or spirits for a wedding or birthday, buy Glenfiddich or Bacardi and get cashback. For the very best luxury beers, wines and spirits. Browse & buy from our expertly chosen selection of quality red & white wine, champagne, prosecco & more. Go to deal now!